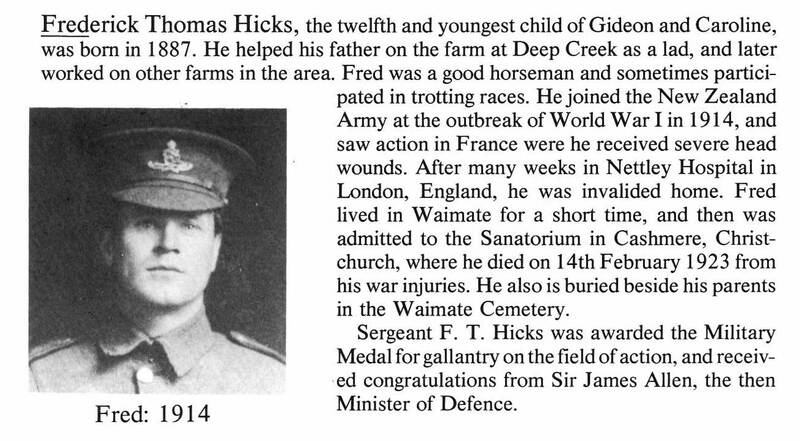 Frederick Hicks, born in 1887, was the twelfth and youngest son of Gideon and Caroline Hicks, Painstown Road, Waimate. He helped his father on their farm at Deep Creek as a boy, and later worked on other farms in the area. Fred was a good horseman and sometime participated in trotting races. He joined the Main Body of the New Zealand Army at the outbreak of war, serving in Gallipoli and then France with distinction. Hicks served with the 10th Battery, 4th Brigade of the NZ Fierld Artillery while on active service at the Somme in 1916. He ultimately suffered severe head wounds in France which saw him invalided home in 1917. Afterwards he lived in Waimate for a short time before being admitted to the Sanatorium in Cashmere in Christchurch, where he died in 1923 as a result of his war injuries. He is buried beside his parents in the Waimate Cemetery.